We offer custom SD card duplication and custom USB drive duplication.When we handle your SD or USB duplication we perform a verification scan on your SD or USB drive to make sure it copied correctly and the data is readable. We offer fast turnaround on these SD card and USB drive types of flash drive. Pricing for SD card duplication and USB drive duplication jobs can vary depending on the amount of data to be copied and verified. Because of these variables we quote each job individually to make sure your needs are been exceeded. We can use the thumb drives you provide, or if you wish, we can get the drives for you. We offer custom laser printing onto your drives for a truly professional drive. Sample of laser printed swivel drive. 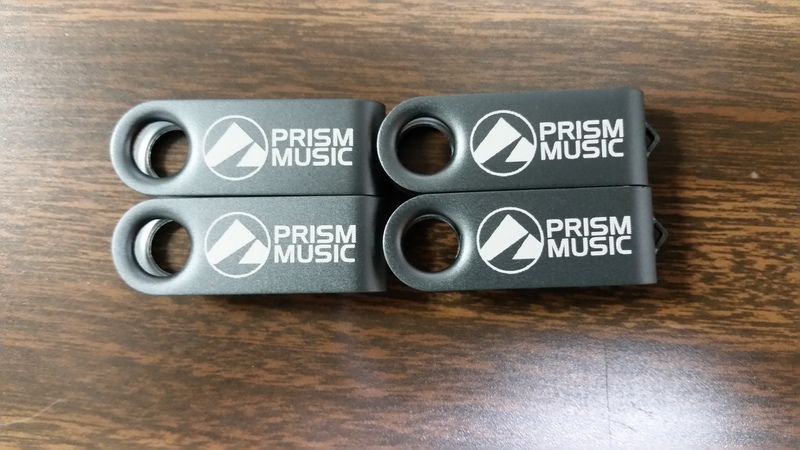 Our in-house laser printing allows your USB drive to carry the impact of your logo along with your data and since it's all done in our shop, you don't have the long wait times that other shops sometimes have as they source your job to China or elsewhere. You've trusted us for many years with your CD and DVD duplication. Let us give you that same quality on your bulk USB drive duplication and bulk SD card duplication as well. USB flash drives are invaluable tools in nearly any company, making it easy for anyone to carry large amounts of data in a device small enough to fit on a keychain. The problem in the past has been finding ways to copy that data to multiple flash drives but wide availability of inexpensive USB duplicators removed that obstacle. Flash drives have found a range of uses in today's business world. IT personnel can carry a library of diagnostic software allowing them to work on computers that aren't connected to the network. Employees who divide their work time between traditional and home offices always have the documents they need. The drives can provide quick and easy backups and are easier to store than external hard drives. As flash drives have come down in price, they have filled the role of disposable media that floppies, CDs and DVDs have previously held. Their small size and large capacity make them ideal for disseminating large amounts of data. For example after a multimedia marketing presentation has been shown at a conference, copies of the presentation can be handed out to clients so they can re-examine it later. The capacity of flash drives that has made them so useful has also made them hard to duplicate. Manually copying files to a drive is fine for one drive, but what about 50 or 100? Early drives with small capacities were quick to copy, but with flash drives now at 16 GB, 32 GB or more the copying process takes longer. It soon became clear that businesses needed a mass copying solution and that's where USB duplicators came in. The idea behind the duplicator is the large scale production of copies of a master flash drive. The master copy is inserted along with the blank target drives. With the push of a button, the data is simultaneously copied to all targets. Some USB duplicators are standalone devices, requiring no computer for their operation. Early duplicators were nice in theory but were very expensive and could copy only a few drives at a time. While they were useful to some companies, they served only a small segment of the market. Over time the technology improved and prices came down. USB duplicators that used to cost thousands of dollars can now be found for less than $700. The number of simultaneous copies has skyrocketed, with the largest duplicators able to copy over 100 drives at once. Flash drives combine high capacity, durability, portability all at a low price. They are going to become even more prevalent in years to come and as they do, USB duplicators will be an integral part of most businesses.